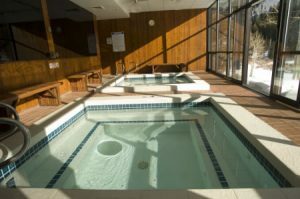 The Lodge has two saunas–one for women and one for men–and shared hot pools with a thirty-foot wall of glass facing Alta’s famous ski run, High Rustler. The sundeck has wonderful views of the ski area. All standard rooms have boot dryers / boot heaters. There is a hair dryer in each room or in the adjacent bathroom, and each room has a programmable guest safe. A bathrobe is available for your use during your stay. Each room is assigned a ski locker, located on the bottom level of the Lodge, so guests can access the slopes outside the door. In keeping with our traditional lodge atmosphere, there are no televisions in our guest rooms. Free wireless internet access is available throughout the Lodge. There is also an internet computer for guest use in the Deck Room, next to the lobby. Afternoon Tea is served from 3:30-5:00 pm in the Deck Room. Kids’ Club is designed to make your Alta ski vacation more enjoyable for both you and your children. We offer a ski school shuttle in the morning to transport kids to and from ski lessons, kids’ dinner and après ski activities. Meet old friends and new friends for a drink après ski in our classic bar, with its warm ambiance and view of High Rustler. Enjoy a massage in the privacy of your room. You may schedule an appointment with Cottonwood Canyon Massage when you arrive at the Lodge, or call us for details. There is no smoking (including no vaping or e-cigarette use) in Alta Lodge. Guests may smoke outside the Lodge; by Utah law, there is no smoking within 25 feet of entryways.